"I don't want her to go to a zoo. I want to set her free." In the early 1960s, wildlife conservation efforts underway in Africa were brought to world attention, in large part due to the popularity of Austrian-born author Joy Adamson's true life stories of Elsa the lion cub. Travelling to Africa in 1937, Joy (nee Friederike Victoria Gessner) would fall in love with the continent where she would eventually meet her third husband, George, a warden for the Kenyan game department. In 1956, the Adamsons would encounter the lioness that became the subject of Joy's three novels, Born Free (1960), Living Free (1961), and Forever Free (1962). The books became bestsellers, and with the release of the first film adaptation in 1966, the Adamsons gained fame as pioneers in successfully returning animals, raised in captivity, to the wild. Born Free would have a profound impact on Western society, especially amongst children, whose exposure to the African wilds and the plight of its inhabitants would lay the groundwork for a growing conservationist movement, and the awareness it raised forever changed the living conditions of animals kept in captivity. The stars of the film, husband and wife Bill Travers and Virginia McKenna, were also deeply touched by their experiences, going on to create a number of conservation-themed films (An Elephant Called Slowly, The Ring of Bright Water) and projects (Zoo Check, Elefriends), and in 1990, they combined their numerous projects in the Born Free Foundation. The film opens with the events that led to the Adamson's life with the lion cubs that would become their life's work. As part of his job, George was called on to destroy a predatory lion, but while doing so also killed its mate, leaving three cubs orphaned. Defenseless and unequipped for life in the wild on their own, they were adopted by Adamsons, who took up the role of parents, raising the young cats with the idea that they would find homes for them in a zoo when they were old enough. Life with the lions was an adventure, to say the least, with their natural curiosity getting them into all sorts of mischief, especially when given free reign of the Adamson household. After five months the cubs were to ship to Rotterdam, but Joy's attachment to the smallest of the three, a female she named Elsa, would inspire her to attempt to return the cub to the wild, where Elsa could live freely. This had never been done before, and the challenges of reintroducing an animal, raised in captivity, to its natural environment were immense. As Elsa grew into a mature adult, her continued presence was unwelcomed by the locals, and the Adamsons faced increasing pressure to give up the lioness, one way or another. Nominated for three Golden Globes and winning a pair of Oscars® for John Barry's score and theme song, Born Free evokes the gamut of emotions, as it follows the Adamson's hard-fought battle to return Elsa to the wilderness into which she was born. The hilarity of the cubs rampaging through the Adamson home or Elsa's dubious first encounter with a warthog, are balanced by the heartbreak of parting with a being that has become an essential part of the Adamson's existence. The struggle to teach Elsa the ways of the wild, and to give up their bond to the animal they have grown to love makes a compelling and moving adventure. While McKenna and Travers do an excellent job portraying the Adamsons, it is the lions who steal the show at every turn. The cubs are adorable, and the grown up is Elsa majestic in her transformation into her natural habitat. The trials, the many failures, and the ultimate rewards unfold in this remarkable story, set against the stunning African landscape. This is a timeless family film that belongs in every collection, and its message is as relevant today as ever. Image Transfer Review: Columbia provides both a 2.35:1 anamorphic transfer, and a pan & scan version. To be honest, the image quality was a bit of a let down. It is apparent that the print was constructed from multiple sources, as there are varying degrees of fidelity here. Problems don't affect the entire film, as for the most part things look fairly good, and some parts are excellent. While colors are reasonably vibrant, some segments tend to be overly yellow. Black levels are generally fine. The disappointment comes in the level of detail, especially in the wide panoramas of the African landscape, which look filtered and indistinct much of the time, more like video than film. There is also an abundance of light haloing on high contrast areas, giving shots with lots of tree silhouettes, or objects against the sky an unnatural appearance. There is a moderate amount of minor print damage, with the opening credits in pretty rough shape all around, plus a few jump cuts and brief, but severe gate wobble in a couple of spots. Transitions also fare poorly, as any dissolves noticeably lose clarity, abruptly cutting into better sourced main shots. Stock photography fares the worst, washed out and extremely grainy. Since I never saw this film theatrically, I can't say how much of this goes back to the original, but I do feel the film shows its age, and had hoped for better. The pan & scan image is similar in quality, but loses a huge amount of image area on the sides. Audio Transfer Review: The two-channel mono soundtrack sounds great, with a full frequency range, and no signs of distortion, edginess or excess sibilance. Dialogue is clear and easily discernable, except where accents get a bit thick. John Barry's award-winning score comes across nicely. No complaints in this department. Extras Review: Given the impact of both the film and its subject matter, it is unfortunate that the only extras provided are a trailer and promotional previews for Living Free, Fly Away Home and Running Free. Joy and George Adamson forever changed public attitude towards wildlife preservation. 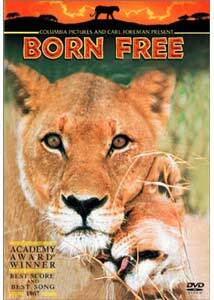 Born Free tells their inspirational story of life with Elsa, the lion cub raised in captivity who was successfully returned to the wild. Poignant in its emotional rewards and full of humor and drama, the film is an essential for any family library, and despite being short on supplements, comes highly recommended.